CR 24016 stored at Juniata Shops near CP works, Dec. 26, '97. Photo by Keith Burkey (82k) CR 24017 stored at Juniata Shops, March 6, '98. CR 24030 at Lyons, NY on Aug. 8, 1997. 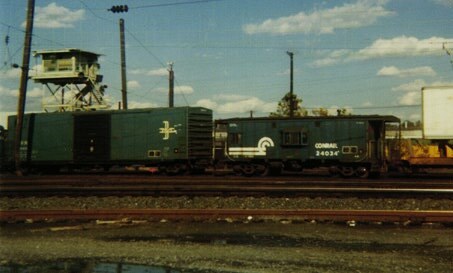 Photo by Jeff Feldmeier (53k) CR 24028 along the NEC at Bristol PA on 9/93. 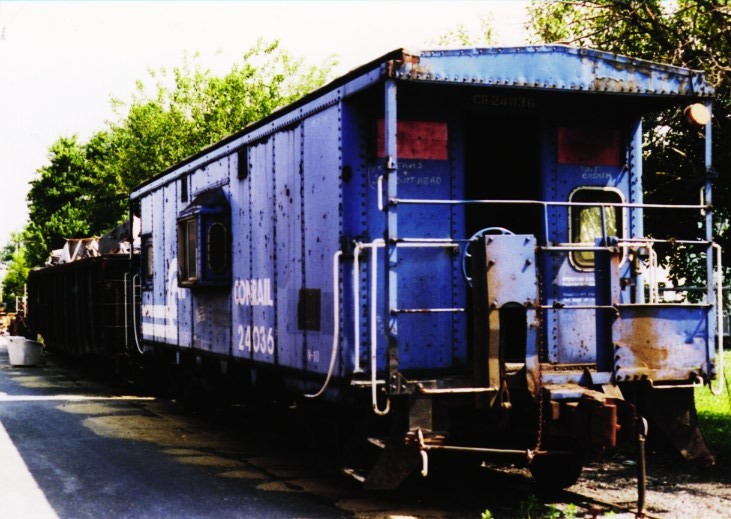 The caboose was used to run to Frankford Jct. on Amtrak. 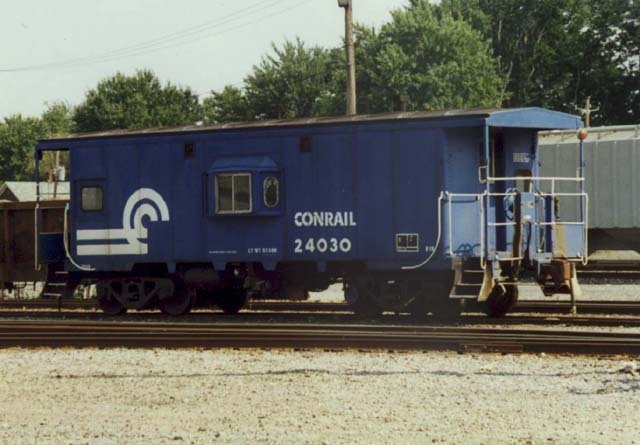 CR 24028 in fresh paint at Trenton, MI on May 11, 1997. This car was outshopped from Juniata in March '97, note the unusual lettering. Photo by Jeff Feldmeier (81k) CR 24034 at Harrisburg, PA.
CR 24036 at Harrington, DE taken July 1996. Photo by T.W.Wolfgang (122k) PC 24045 at Beaver PA on a Detroit Edison Unit Coal Train, one of at least two, specially painted, metallic blue N10s assigned to them. May 1973. 49 cars 24000-24049 ex PC 24000-24049. Bay window type, small centered bays, riveted, 50 cars built at Altoona in 1969. These cars were never equipped with roofwalks. 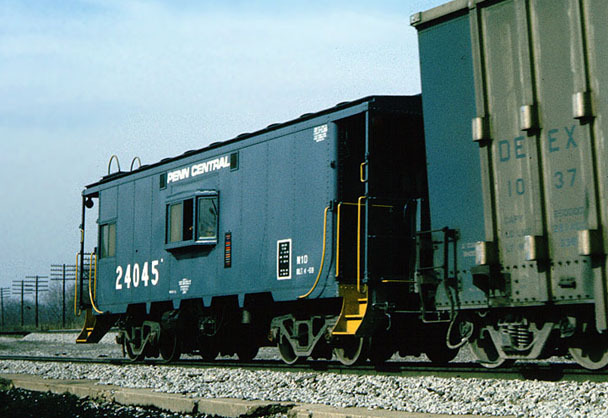 PC 24015 was scrapped 7/10/71. Please see N-7B for additional information. 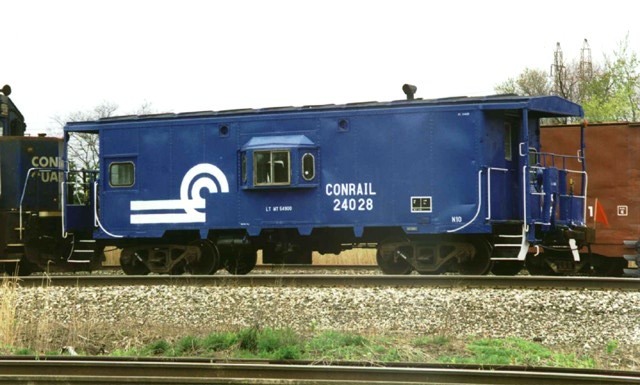 Some of these cars, including 24032 and 24035, were assigned to Detroit Edison unit coal trains by the PC and painted metailic blue like the DE locomotives, I don't know if this scheme was retained by Conrail. Outlines created from photographs of N-7B CR 21039 and others by T.W.Wolfgang. Could be kitbashed based on Athearn or Walthers bay window caboose. The small bay that comes with the Walthers kit would be a better start.